Constructed to Audi’s ‘Terminal Concept’ dealership template, originally designed by Allmann, Sattler, Wappner Architekten GmbH, the extensive new showroom and workshop complex replaces Sytner’s previous facility, which it had occupied since 2007. As part of the energy efficient design, the dealership uses natural ventilation to ensure the carbon dioxide levels and temperature are managed effectively within the entire building to create a comfortable environment for staff and customers within the large open plan showroom as well as for its technicians in the pristine workshops. SE Controls supplied, installed and commissioned the complete natural ventilation system, which involved the supply of two SCCO Schuco 500mm stroke chain actuators and a precision OS2 controller to provide automatic operation of the sloping vents in the showroom atrium. Manual operation of the vents also formed part of the showroom system, operated by tamper-proof key operated switches. 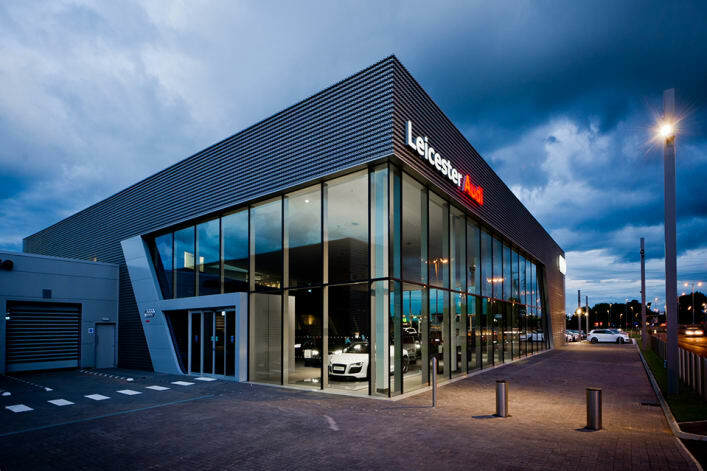 Audi Leicester’s workshop area is split into six separate areas, each with its own localised ventilation, control and manual over-ride system. To actuate the Schuco AWS 55 vertical vents, SE Controls installed 18 of its new 24 Volt SECO N 24 40 chain actuators together with six OS2 controllers and key operated switches to give accurate and flexible control over the system.